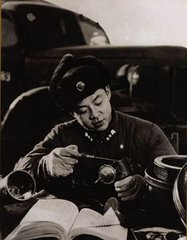 活雷锋 - A Modern Lei Feng: On Politeness Part 2: Accessibility? Are. You Kidding. Me? On Politeness Part 2: Accessibility? Are. You Kidding. Me? I signed up for the 2nd Annual Blogging Against Disablism Day and so here is my entry. Unlike most participants, this one is coming really late (its already May 2nd here in the midwest), but it does allow me to take a look at some of the other bloggers. Exactly which category this entry fits into is up in the air, perhaps like often happens, I'm unique and deserving of a category of my own. I've written a lot already on the topic of disability and will probably write a lot more, but I hope this entry will be somewhat unique. The fact that this is happening (or supposed to happen) on May 1st is important. Though it isn't celebrated in America, May 1st is International Labor Day and celebrated all over the world. Over the years, it has been turned into a day to memoralize much more than the workers of the world, its become a day to put forth a number of Leftist causes (most recently, in the US its been used for immigration rights). To use this day to attack discrimination against the disabled is a great thing. Yet, while posters right a lot about conditions in the US, the reality is that the problems that exist are more like "mole hills" in the face of conditions in other country. While I admit that the situation for the disabled in the US (and from recent experience Canada, and you could probably through the UK in there, too) are far from perfect, those nations are much closer to the goal of 100% accessibility than in most places. The "mole hills" I talk about may be small, but they certainly aren't insignificant, however in the greater scheme of things, how significant are they really? The focus of this post is going to be one of those other places, the main focus of this blog, China. Government Protection: Whether the Disabled Federation isn't willing to help or isn't able to help is an interesting question, but it really doesn't matter because at the end of the day, they can't help. The few laws that are in place to help the disabled are ignored, enforcement is non-existant, and nobody bothers to push or promote new laws. So that's just a breakdown of a few of the main areas. I try to write on these matters not because I dislike China, its the exact opposite, I love the country so much, but these things are just so disheartening. The fact I finally have a job in the motherland and yet the person closest to me has no desire to go back because what they may face there really hurts. But the reality is I totally understand that thinking, I'm even worried about myself, how I will be treated when I get there. an arm amputee somehow was able to get the doctor to lie on the physical exam necessary before students start college, after 3 months of studying, the dean found out about the amputee, who by all accounts was thriving, but was kicked out of school because of their physical condition. a national athlete, who happened to be blind, but was otherwise in perfect physical health was denied the insurance they needed to travel abroad because of their blindness, while many people who could see, but were in horrible physical shape are given insurance without even thinking. as mentioned above, a deaf person cannot get a driver's license solely because of their lack of hearing. those with mobility impairments often cannot get into "regular" universities and are forced to attend the "special" universities for the disabled, despite the fact that they require no accomodations other than possibly an elevator and a ramp. But a few of the many, many examples that can be offered. So how does China change? It's through more and more interaction. NGOs that represent the disabled need to meet with the Chinese Disabled Federation, however they need to do so in a respectful, but firm manner. The ultimate example of what not to do is the NFB, who fail to do a lot in pushing the US government where 70% of blind people are unemployed or underemployed, but talk down to the Chinese disabled groups, where probably 70% of blind people are employed (but only have 2 or 3 career choices). Which is better? It takes those who are disabled and gone abroad to at least make an attempt at returning and working. It takes those who are non-disabled and seen how things work abroad to implement those foreign practices. It also takes those in China pushing the Disabled Federation more and more. Most of all, it takes a compassionate society, one that is willing to look beyond disability and look at what a person can do. One that is willing to help all people and isn't leaving millions of their fellow citizens behind. Modernization isn't only about big, fancy buildings and getting richer, its about implementing modern thinking. While it is important to push for improved conditions in your own country, American (and Canada, and again, probably the UK) are heaven for the disabled, while many other countries are hellish. So take this day to complain (or I guess I should say, "highlight the conditions that need improvement where you are"), but also think about people everywhere else in the world and try to do something for the disabled elsewhere, too. yes,that's true.I don't see some disabled persons living as we live.I seldom see them or contact with them. I wonder how they live. if country's system is not good,what we could do is to do on our own,difficult but independent. your blog is a good reminder to the fast-developing country. thanks for your kind comments. I agree, there isn't very much an individual can do, but have an open mind and if you happen to come across someone who is disabled, treat them as a normal person. Where in the World Is A Modern Lei Feng?